The FVC-034-2 from Wright Valves is a 3/4” Sweat Isolator Flange Valves (Pair). Pump isolation flang.. The FVT-034-2 from Wright Valves is a 3/4” Threaded Isolator Flange Valves (Pair). Pump isolation fl.. The 50402-2 from Webstone is a 1/2" Sweat Uni-Flange Ball Valve (2). It has a heavy duty forged bras.. The FVT-100-2 from Wright Valves is a 1” Threaded Isolator Flange Valves (Pair). Pump isolation flan.. The 50403-2 from Webstone is a 3/4" Sweat Uni-Flange Ball Valve (2). It has a heavy duty forged bras.. The FVC-100-2 from Wright Valves is a 1” Sweat Isolator Flange Valves (Pair). Pump isolation flange ..
1 Taco Stainless Steel Freedom Flange (Pair)"
The 110-252SF from Taco is a 1" NPT Stainless Steel Freedom Flange (Pair). It Fits 005, 007-0011, 00.. 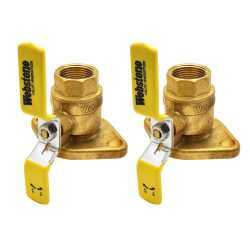 The 40403 from Webstone is a pair of 3/4” IPS Isolator Flange Valves. It offers a convenient and eas.. The 50405-2 from Webstone is a 1-1/4" Sweat Uni-Flange Ball Valve (2). It has a heavy duty forged br.. The 50413-2 from Webstone is a 3/4” Sweat Uni-Flange Ball Valve w/ Hi-Flow Hose Drain (2). It has a .. The 40414-2 from Webstone is a 1" IPS Uni-Flange Ball Valve w/ Hi-Flow Hose Drain (2). It has a heav.. The 40415-2 from Webstone is a 1-1/4" IPS Uni-Flange Ball Valve w/ Hi-Flow Hose Drain (2). It has a ..